In a recent column on our housing crisis, I explained that we have big unemployment problem in rural Newfoundland that is causing young adults to move to larger centres. 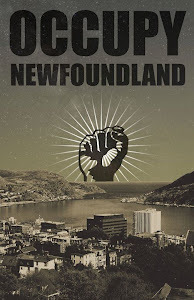 This got me curious about if this is also true in other provinces or if it is special to NL. 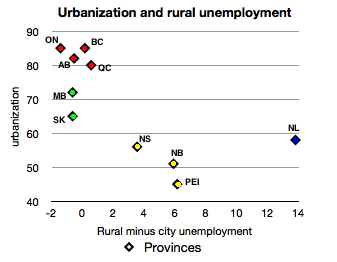 It turns out that in most parts of Canada, there isn't a big difference in unemployment between urban and rural areas. Nationally in 2012, the unemployment rate was 7.7% in rural areas and 7.2% in cities (i.e. census metropolitan areas and census agglomerations). In recent years unemployment has consistently been a bit higher in rural areas, but usually within 1%. The only provinces for which there is a big difference between urban and rural are the Atlantic Provinces: Nova Scotia, New Brunswick, PEI, and NL. I think it is not a coincidence that these are also the provinces with the largest share of rural inhabitants. Consider the following chart. The dots represent provinces, the vertical axis is percent of population in urban areas (2006 census) and the horizontal axis is the difference in unemployment rate between rural and urban averaged over five years. In the remaining provinces there is no significant difference between urban and rural unemployment. The four biggest provinces, marked in red, all have urbanization over 80%. Manitoba and Saskatchewan have lower levels of urbanization, probably reflecting the importance of farming in the prairies, but are still more urban than Atlantic Canada. One interpretation of this data is that most provincial economies are moving towards an urbanization equilibrium level of 75-85%. If so, then we should expect the rural-to-urban migration in NL to continue for another two or three decades.